> A space with objects from the conscription period ’50-’60. The PSU cabinet, bunk bed, and the first gray boxes will remember many old soldier. >In one of the officers’ sleeping quarters showcases by the soldiers of the Royal Military Police (the Kmar) were used. > Higher soldiers were supposed to know the art of sword fighting. Here is an original certificate from 1900 that can be found together with the weapons used. > The former Artillery and ammunition factory “Hembrug”, later Eurometaal in Zaandam, has some shell cases and other interesting things left on our fort behind. > An almost lost toys and collector’s item nowadays are tin soldiers. A small collection of old soldiers at the fort to see. What’s more fun than making your own toys? At regular intervals, the self-casting and painting tin soldiers at the fort demonstrated with different molds. Children can paint it yourself. Cuter than Playmobil;-) See our announcements of demonstrations on the website. 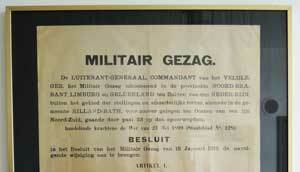 The Line of Beverwijk was built in 1800 and consisted of 26 earthen fortifications between Beverwijk and Wijk aan Zee. called Lunetten. A model of such a lunet is on the fort to find. Dressed with some tin soldiers from the Napoleonic period. > The fortress island had from 1903 regular “occupation”. By the military in both mobilization times, between the fortwachter and his family and by soldiers who were entrusted with ammunition storage in the cold war and where the fort is also used as a “parking place” for Anti aircraft guns (Bofors 40 L60) which the railway junction Uitgeest had to defend. Numerous objects excavated at the fort grounds and exhibited.